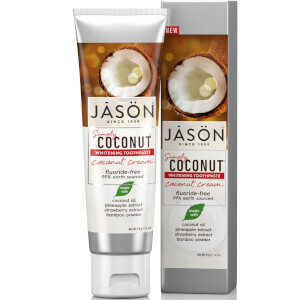 Reveal striking pearly whites with JĀSÖN Whitening Coconut Cream Toothpaste, a whitening toothpaste enriched with a cocktail of essential ingredients from the earth (99% earth-sourced). Promoting bright, stain-free teeth, the toothpaste combines Virgin Coconut Oil with Bamboo Powder, Strawberry extract and Pineapple enzymes to promote a brighter, whiter-looking, gleaming smile. Gently cleansing teeth, the whitening toothpaste will leave your mouth feeling sparkling clean with fresh, sweet breath. Free from fluoride, SLS, parabens, artificial colours/sweeteners, saccharin, propylene glycol and gluten. Keep out of the reach of children under 6 years of age. If you accidentally swallow more than used for brushing, get medical help or contact a Poison Control Centre immediately. Glycerin, Aloe Barbadensis Leaf Juice (1), Calcium Carbonate, Sodium Cocoyl Glutamate, Aqua (Water), Cocos Nucifera (Coconut) Oil (1), Ananas Sativus (Pineapple) Fruit Extract (1), Bambusa Arundinacea Stem Powder, Fragaria Vesca (Strawberry) Fruit Extract (1), Cellulose Gum, Sodium Bicarbonate, Alcohol (1), Natural Flavour.